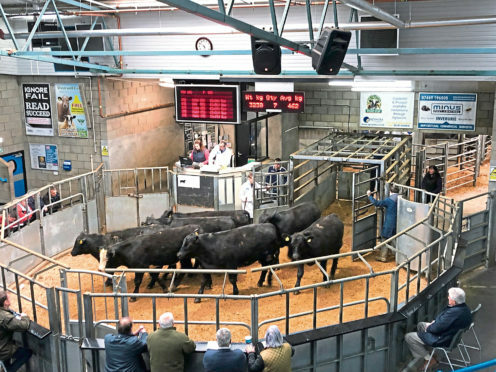 Aberdeen-Angus store cattle sell through the ring at the Thainstone Centre, Inverurie. An entry of 886 Aberdeen-Angus, Beef Shorthorn and other native-bred store cattle went through the sale ring at the annual show and sale. “A tremendous show for quality Aberdeen-Angus and Beef Shorthorn cattle met a very brisk trade, with top prices of £1,415 and 290.3p per kg paid for Aberdeen-Angus crosses,” said ANM. In the show, sponsored by the Aberdeen-Angus Cattle Society and judged by John Mackay of Fletcherfield, Kirriemuir, the championship title was awarded to a 562kg Aberdeen-Angus cross bullock. Put forward by the Seatter family – Francis, Jacqueline and son Robert, of Elsness, Sanday, Orkney – the bullock landed the family their second consecutive win at the fixture before selling to the judge for £1,360. The reserve title went to a 560kg Aberdeen-Angus cross Charolais heifer consigned by Cameron Ewen, Meikle Toux, Cornhill, Banff. By Ettrick Godolphin, and out of a pure Charolais heifer, she sold for £1,270 to Gordon Reid of Mill of Haulkerton, Laurencekirk. Other leading prices included £1,415 for a 714kg Aberdeen-Angus cross bullock from How Farms, Sanday, Orkney.